The Family Connection of Greater Lowell (TFC) is a nonprofit, non-denominational, volunteer-run organization designed for infants through preschoolers. Our mission is to provide social and recreational opportunities to Merrimack Valley families with young children. The TFC features a large indoor area where young children can play in a safe environment, and where parents can connect with one another. Our playspace offers climbing structures, tricycles, infant toys, a train table, a toy kitchen with accessories, giant building blocks ... and much, much more! 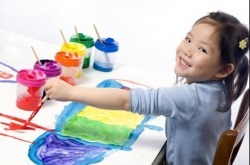 Every playdate includes time for free play, snacks, arts and crafts, and a music circle. Check us out - your first two visits are free!